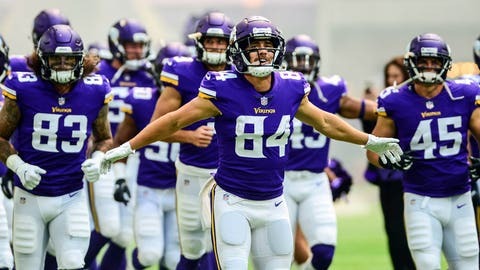 Is the landscape of the Minnesota Vikings’ wide receivers changing? Chad Beebe, playing in his second NFL game, was active for 29 offensive snaps in Chicago — the same amount as former first-round pick Laquon Treadwell. Beebe ran 23 routes and caught his only target for an 18-yard gain in the fourth quarter. Treadwell, who ran 17 routes, was targeted four times and caught one pass for seven yards. He drew a pass interference call and the Bears intercepted a pass on two of his other targets. Now, the two receivers really play different positions — Beebe in the slot and Treadwell primarily on the outside. Giving Beebe snaps over Treadwell would mean Adam Thielen, who runs over 60 percent of his routes from the slot, would get more work on the outside. One thing is for certain: Beebe passed up Brandon Zylstra on the depth chart. Zylstra was on the field for one offensive play. The Vikings seem comfortable with the Minnesota native playing mostly special teams. — Aldrick Robinson was back to doing Aldrick Robinson things. He played in just nine snaps but caught two passes for 24 yards … and a touchdown, of course. Four of Robinson’s nine catches this year are for scores. — Everson Griffen was on the field for 80 percent of the defensive snaps, his highest percentage of playing time since Week 2 against Green Bay. — Due to the Vikings abandoning the run early, Latavius Murray played in a season-low six snaps. He rushed four times for five yards. — Danielle Hunter was held without a sack for just the second time in 10 games. He was active in 84 percent of the snaps. — Ameer Abdullah was effective as a kick returner, averaging 28.5 yards per return in his Vikings debut. He was on the field for exactly one offensive snap and caught a pass from Kirk Cousins for a 10-yard gain. — Thielen played in 100 percent of the snaps for the second time this season.